PCE Thursday Night Lecture Series presents metal sculptor and MassArt instructor, Marjee-Anne Levine. In 1998, Marjee-Anne Levine attended her first ironcasting conference. This formative experience introduced her to an entirely new world: fire, knowledge, art, performance, history, ritual, skill, and most importantly, IRON. She saw dirty faces that would turn into colleagues, and heard the history from those who made it. One thing was clear though - as a young woman, she was unmistakably in the minority. Marjee went on to receive her BFA from The School of the Art Institute of Chicago (2000), and her MFA from Georgia State University (2004). She has been working in and running professional foundries ever since, currently as the manager of operations at Sincere Metalworks, Chelsea, MA. 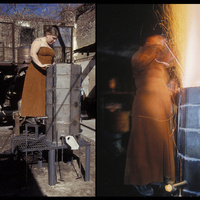 Marjee also teaches foundry and ironcasting at the Massachusetts College of Art and Design. That community she was introduced to so many years ago has now become Marjee’s home. She is an internationally recognized expert in the field of ironcasting, and was the 2015 and 2017 co-chair of the National Conference on Contemporary Cast Iron Art & Practices. Marjee’s personal, professional, and artistic work is an ongoing effort to explore, analyze, and articulate her place within the iron world; thus, figuring out what little girls are made of.